Mineral Bronzer in 'Warm Kiss' & Finishing Powder in 'Matte' by Mineral Hygienics - Review & Swatches! | Sahrish Adeel - Malaysia based Pakistani Beauty & Lifestyle Blogger! 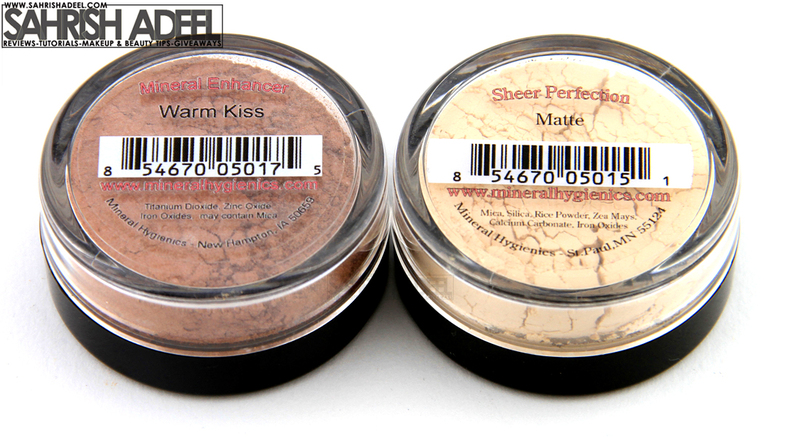 Mineral Bronzer in 'Warm Kiss' & Finishing Powder in 'Matte' by Mineral Hygienics - Review & Swatches! Foundation alone on face flattens all the features. A bronzer is a must thing to put that color back and finishing powder is a must thing to keep it all together throughout the day! In this post, I am going to talk about two products by Mineral Hygienics. First one is, Mineral Bronzer in 'Warm Kiss' & the second one is Finishing Powder in 'Matte'. Mineral Hygienics says: "Everyone's favorite! Soft, sheer, subtle sun-kissed glow. Create the illusion of radiant, sun-kissed skin! Use as a healthy looking complexion booster, blush, cheek contour, eye shadow or lip color. 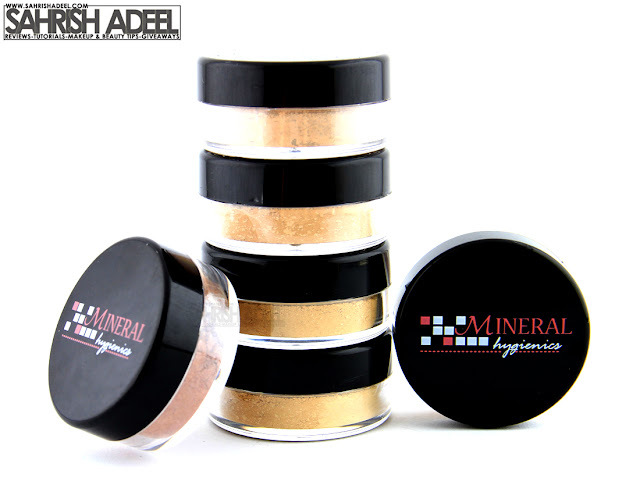 Our Sheer Mineral Enhancers are light, natural and are perfect for color adjustments to your foundation." Nicely pigmented, a tiny bit is enough for a decent color. Gives sheer to heavy finish depending upon the amount of product. Multipurpose; can be used as bronzer, blush, eye shadow & even as a lip color. Powder formation helps to keep oily skin shine free. Color tends to tone off in about 2-3 hours. Mineral Hygienics says: "All of the benefits of our Sheer Perfection Mineral Finishing Powder, Plus the added benefits of oil absorption. If you are prone to oily skin. Use this special powder to reduce oil and shine. Use as much as you need, all throughout the day, it won't cake up or enlarge your pores." Keeps skin shine free for longer hours. Never looks cakey, even if you layer it many times. Keeps the makeup in place throughout the day. Keeps under eye concealers from creasing throughout the day. Gives the skin and makeup a really nice finish. There is absolutely nothing bad about this product. In this picture, 'Warm Kiss' looks a bit peachy/orange but its more towards the brown shade. The 'Matte' looks white as this swatch is heavy to show you the color. It totally gets transparent on the skin. I have used these products in some looks on my blog that you can see here & here. 'Warm Kiss' is a really nice multipurpose product and I really like it. I have been using it more as a bronzer but sometimes I use it as a blush and an eye shadow as well. It gives a really nice color to the skin. The only thing I find a bit odd is that it tones off after 2-3 hours if it is applied over a powder foundation. However, if I apply it on a liquid foundation and then apply any powder, it stays in place for longer hours. 'Matte' finishing powder is just an amazing and stunning product. I have really really oily skin and the most problem area is my under eye area. My concealers tends to crease because of oil. But since I have started using this product, I have never had a creasing problem. I totally love this product. It keeps my foundation in place for the whole day. I am a big fan of this finishing powder now. For me, it is like a dream come true. If you like powder products, you are going to like these two as well. And, if you have oily skin, you are going to love this finishing powder. It is just perfect. Each full size jar of bronzer contains 20 gram of product and costs $20 & each full size jar of finishing powder contains 40 gram of product and costs $19. Click on Warm Kiss & Matte to know more about the products. Mineral Hygienics ships worldwide. Check out there website here to shop these amazing products for yourself and many other products. Disclaimer: PR sample sent for review consideration. My opinions are 100% honest for my readers. For more details, read Policies.